So much has been written about Whitechapel and Spitalfields that I decided to investigate further east. Along the way you can wander by a canal, admire Georgian architecture, find a church that flies the Red Ensign and visit a farm where chickens lay blue eggs. The route ends at Stepney Green station. 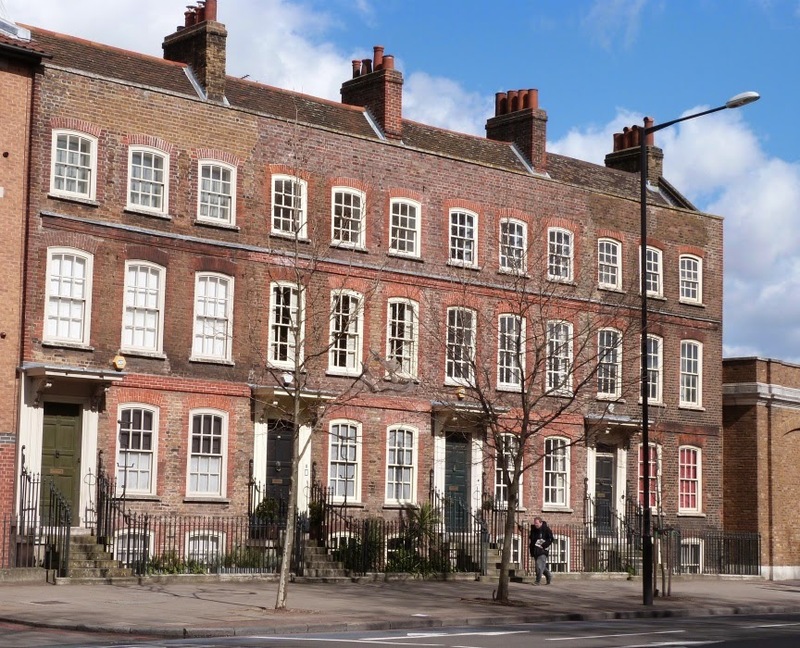 Before beginning your exploration you might like to read about the history of the East End, which has been shaped by successive waves of immigrants. By the end of the nineteenth century the East End was predominantly Jewish. However, during the rebuilding process following slum clearance in the 1930's and bomb damage during WW2, old neighbourhoods gradually disappeared and many families left. Bangladeshis began arriving in the 1960's and are now firmly established, so things are changing once again. From the Mile End Underground station turn left towards a bridge covered in trees and grass. This is Mile End Park, created on a former industrial site next to the Regent's Canal. The quickest way to access this imaginatively designed green space is to cross the major road at the lights and climb the steps on the left hand side of the bridge. (If these are a problem, make your way under the bridge and round the corner where there is a gentle slope.) Going past the fountains, from either an upper or lower level, will bring you to the tow path. My route is to the left here, but if you want to explore more of the canal/park you can turn right and come back to this point to pick up the trail later. At first the path follows the line of the park, with houses on the opposite side, but soon you will reach Johnson's Lock. The ramp was built to enable working horses that fell into the canal to clamber back to dry land. Some of the warehouses are still in place, but you have to use your imagination to see Stepney Gasworks that was on the opposite bank. Fully operational from the 1830's-1970's, it has been redeveloped as housing. Just before the bridge at Ben Jonson Road is the Ragged School Museum (free for general visitors, but check website for opening days). To continue the walk you need to be at street level, so go up the steps here. Alternatively make your way under the bridge and turn left along Rhodeswell Road before crossing the canal. In fact it is worth popping under the bridge anyway, as there is a remarkable view of the Canary Wharf tower with a tall chimney in the foreground. This is not the remnant of a long-disappeared factory, but an Edwardian ventilation shaft for a sewer - the Northern Low Level No.2 Sewer and the Limekiln Dock Inversion Sewer to be precise. Once in Ben Jonson Road take the second on the left, Aston Road. Stepney suffered badly during the Blitz. From the London Bomb Sight Map you will learn that five high explosive bombs dropped in the vicinity of this street alone, which is why the northern end has modern buildings. However just after Cayley Primary School several of the original terraces remain. Matlock Street on the right is a good example. Continue to Salmon Lane and cross to Flamborough Street. Pass through York Square and turn right into Barnes Street. At the crossroads left into Salmon Lane and cross over. There's a Victorian Parish boundary marker stone for Ratcliff on the wall near the corner. This was an ancient shipbuilding village whose somewhat lurid story makes fascinating reading. At the end of the street pass through an old cemetery. From the info board you will discover that Stepney has a long history of nonconformity and that this burial ground was opened in 1779 by a church called Stepney Meeting which closed in 1853. There were some almshouses and a charity school on the site, but these were destroyed in WW2. When you leave the cemetery go to the right up White Horse Road. Just after Matlock Street you will be at a park.To the left is a set of (former) almshouses founded in 1691 by Lady Mico, widow of a wealthy member of the Mercer's Company. Rebuilt 1856. 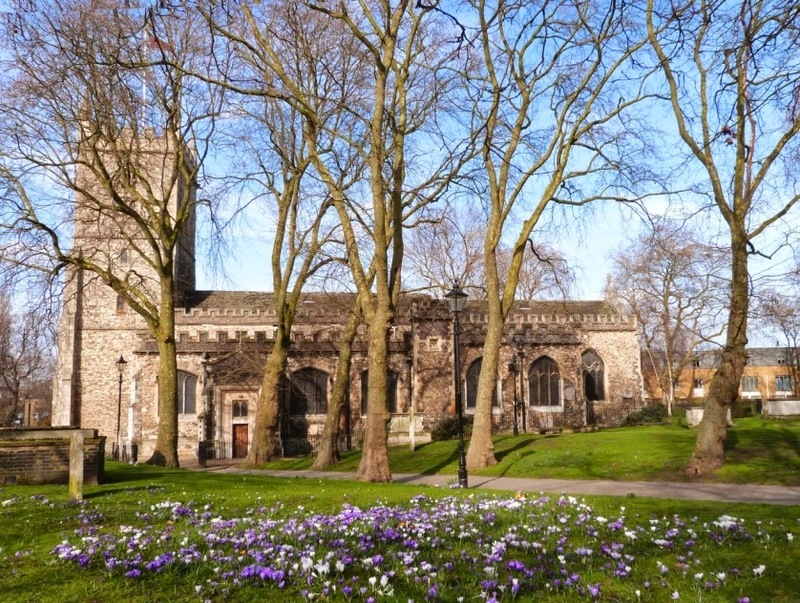 Take the leafy path which runs between St. Dunstan's churchyard and White Horse Road Park. 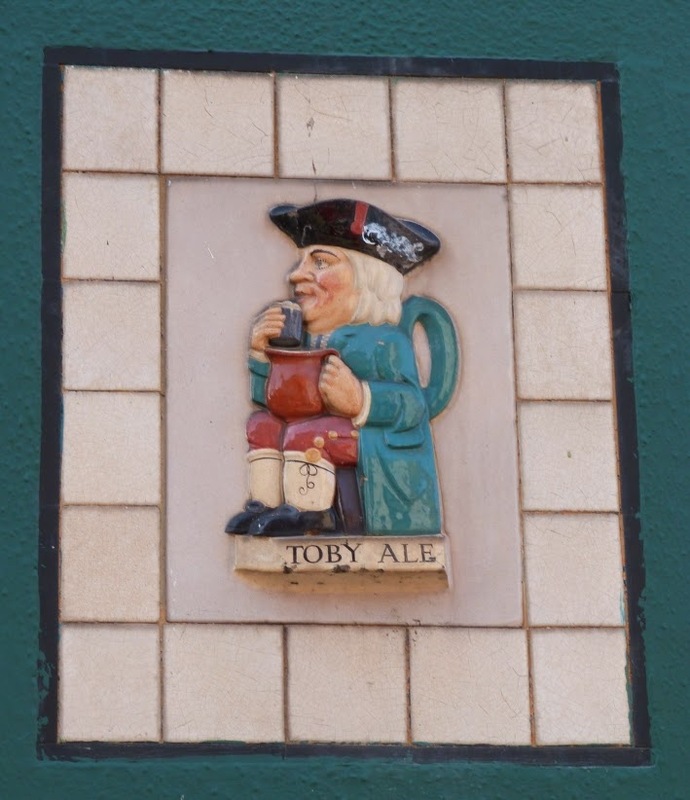 Where it broadens out is a short row of buildings, the last of which has some tiles with a Toby jug motif which indicates that it was a Charrington's pub. Turn into Durham Row, once a thriving neighbourhood shopping street. Alas, only a few buildings remained after the Blitz. No. 5 is particularly engaging, since it has the original exterior shop fittings and shutters. Return to White Horse Road and walk through the churchyard of St. Dunstan's. On the way you may wonder why it is so huge. The reason is that in the seventeenth century two serious outbreaks of plague meant that more land had to be added to cope with all the burials - during The Great Plague of London 154 took place on one day alone. Before entering the church itself, glance up at the tower. If you are a mariner you may be surprised to observe the Red Ensign fluttering from the flagpole, as this is usually reserved for merchant shipping. Because the church was near the old Port of London and the docks, sea captains often sent the certificate of a birth that took place on board to St. Dunstan's. As a result it became known as the Church of the High Seas and the parish records are of considerable importance to genealogists searching for the ancestors of people now in Australia and America. The church is a Saxon foundation, a fact that is commemorated by an ancient stone cross preserved by the altar. However, the church was re-clad with stone in the 1870's, and is somewhat Victorian in appearance. There are many other monuments - those with a particular interest in this kind of thing can read the texts here. The church miraculously survived the war, though some glass was lost when a rocket exploded in the churchyard. A set of new windows was installed in the 1950's. One last comment about the church: the bells of Stepney are famous for being included in the old nursery rhyme which lists the bells 'of London'. You will probably recognize it as 'Oranges and Lemons'. On the St Dunstan's website you will find the times when it is open to visitors.. As usual with churches, it's safest to check if making a special journey. In any case do have a look at the website, as it has excellent old photos. On leaving the church, go straight ahead then turn right into Stepney High Street (which scarcely exists) to find a safe crossing. Walk left past the railings of Stepney City Farm, then right into Stepney Way to get to the entrance. 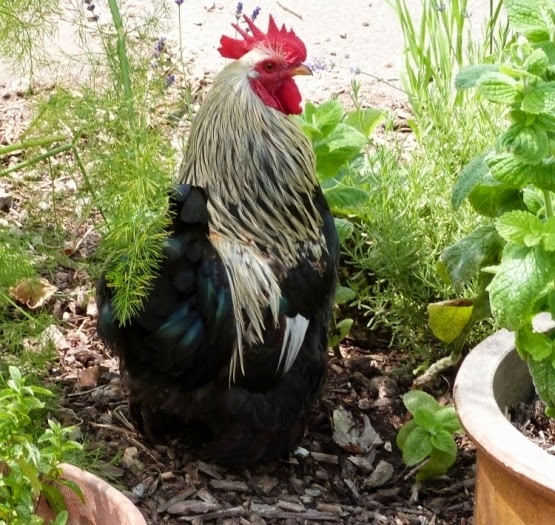 The farm is a delightful place, with a cafe (see website for opening days) that specializes in simple locally-sourced food and its own allotment produce as well as selling eggs from the farm's free range hens. I was intrigued to find that it is not only ducks that lay blue eggs. Ruins of a Congregational Church (built on the site of the Stepney Meeting mentioned above) are to the west, and a crumbling Georgian doorway, once part of a Baptist College Chapel, is visible from Stepney Green. During excavations for the Crossrail link the remains of a medieval manor house were found. As the chickens wander round your feet there is a curious sense of the present time colliding with history - especially if you glance across to St. Dunstan's church. The farm is closed to the public on Mondays. After admiring the livestock, return to Stepney High Street and walk to the left to reach Stepney Green. Go left again and at the crossing place head over towards Whitehorse Lane which is nearly opposite. Almost immediately enter Rectory Square where there is a big, rather forbidding, Victorian building, Temple Court, once the East London Synagogue. Retrace your steps to Stepney Green. Walk right to arrive at Stepney Green Gardens - two streets divided by a narrow garden with mature trees.This is actually an example of Manorial Waste - left-over strips of common land, in this case belonging to Stepney Manor. 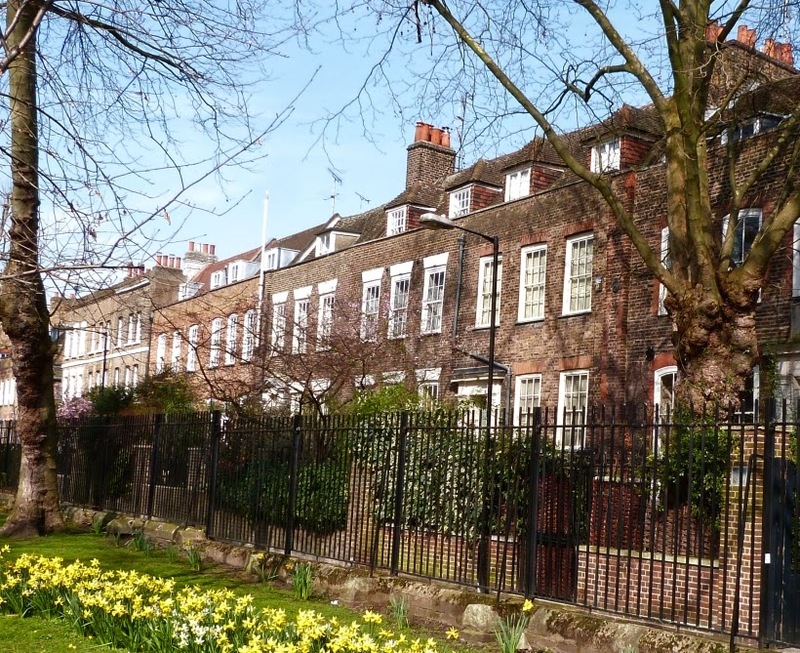 On the north east side the red brick block with ornate white 'aprons' under the windows is Stepney Green Court, built in 1895 for the Rothschild's Four Per Cent Dwelling Company to provide housing for Jewish artisans. Next door are the monogrammed gates of the Stepney Jewish School, which is now in Ilford. Nos. 61-3 were erected by a sugar-refiner in the 1760's as part of a terrace of seven houses. Some of the other people who first lived in the Gardens would have been traders who had amassed their wealth through shipping enterprises of various kinds - both on the river and the sea. Further along, The Rosalind Green Hall has had some interesting changes of use. It began life as a Primitive Methodist Chapel, then was used as an Orthodox Synagogue. Nowadays the hall is home to a boxing club (a traditional East End sport) and skills training centre. 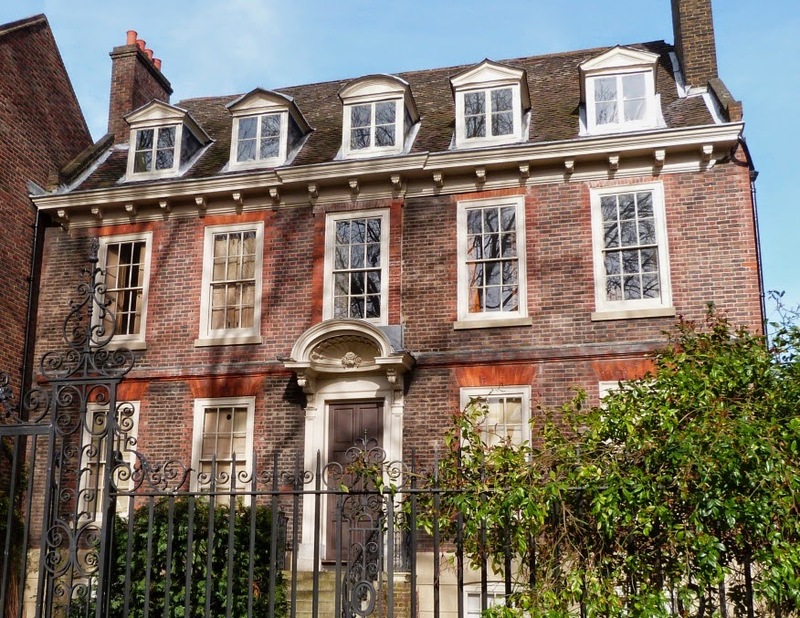 Set back behind railings, No.37 is a fine example of a 17th century merchant's residence. Together with the neighbouring house it became a Jewish Old People's Home. The odd arrangement of stairs visible through the windows shows how No.35 was altered for institutional use. 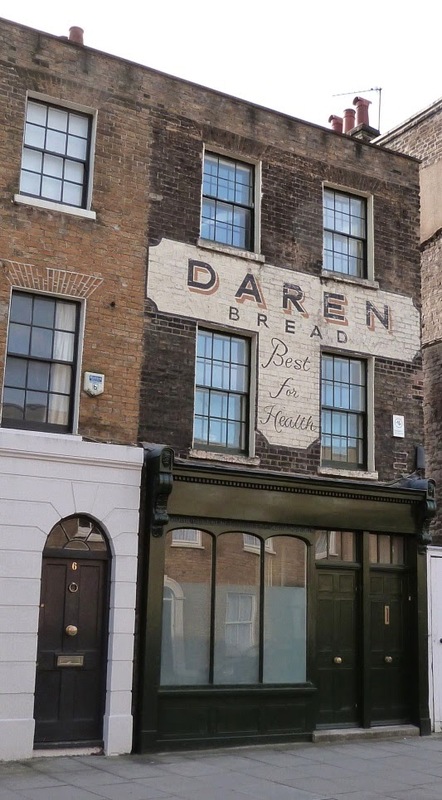 The plaque above the doorway has the information that the building was also once a dispensary. Although bombs destroyed several of the original houses, much sensitive rebuilding/infilling has been done on this side. (It's best to try to ignore what's happened on the north west.) Nos 25-27 are Victorian, the attractive Nos. 21-23 are substantially reconstructed. At the end of the green (left) are more artisan flats, this time erected by the East End Dwellings Company in 1899. Adjoining them is a pretty Georgian terrace with arched doorways. Walk towards this, then turn right, passing a house with an advert for bread painted all over it. When you are at the Mile End Road, go left and cross at the lights towards a row of Queen Anne houses - an astonishing survival. To the right is the Anchor retail park on the site of Charrington's brewery - you can't miss the huge chimneys which were a decorative (as a matter of fact they're fairly ugly) feature of the old offices. Continue to the right to find two houses built in the 1740's. Half-hidden by an overgrown hedge, they give the impression of being full of secrets. 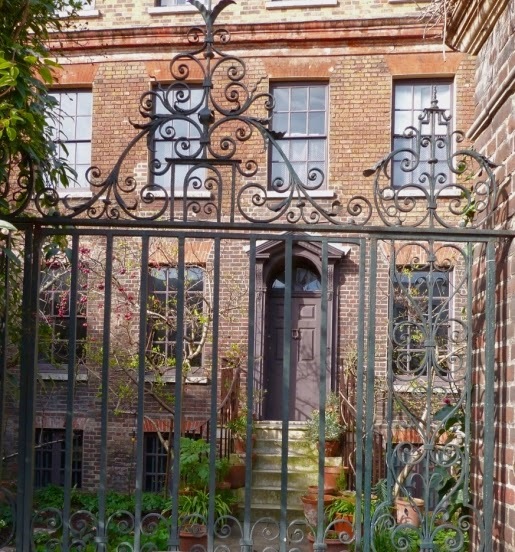 Peep through iron gates to glimpse the tiny gardens - even these are eccentric. On the corner of Stayners Road are the former Mile End Public Baths (1932), now the Globe Centre, a resource for people living with HIV. 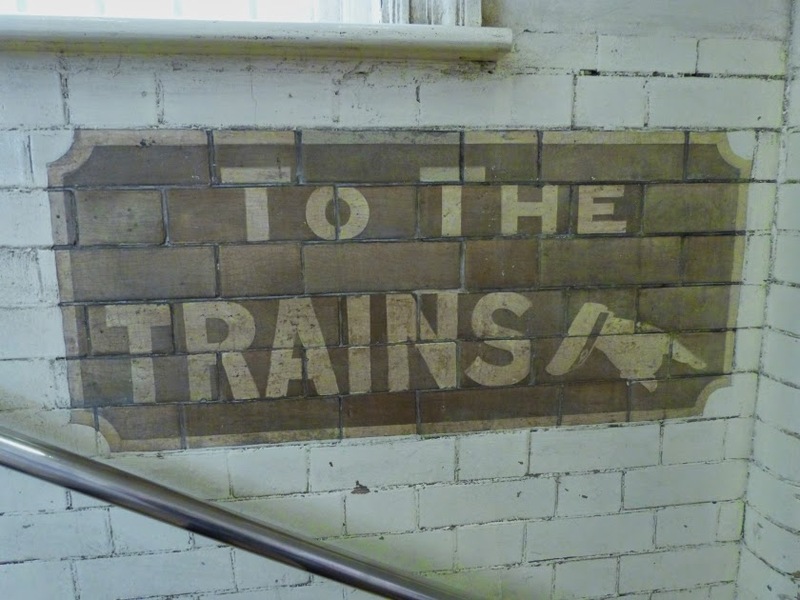 Finally you arrive at Stepney Green Station, which was opened in 1902 as the Whitechapel & Bow Railway. Note the pretty fanlights over the entrance doors and the old painted sign at the top of the stairs. Somehow nothing is quite what you expect in this part of London. No.37 Stepney Green Gardens/No.4 Stepney Gr. 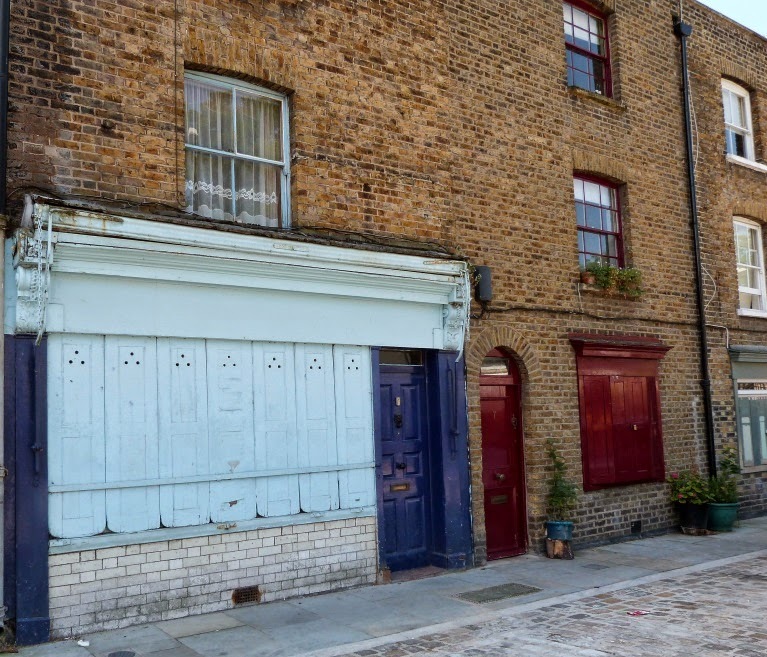 *If you would like to discover more oddities in the Mile End road, click here for my route starting from Stepney Green Tube station. It can be done as a part of this one, involving only a small deviation. As this is an unusually long post I have produced a printer-friendly version without images. Mile End is just one route from the many to be found at London Tube Rambles. 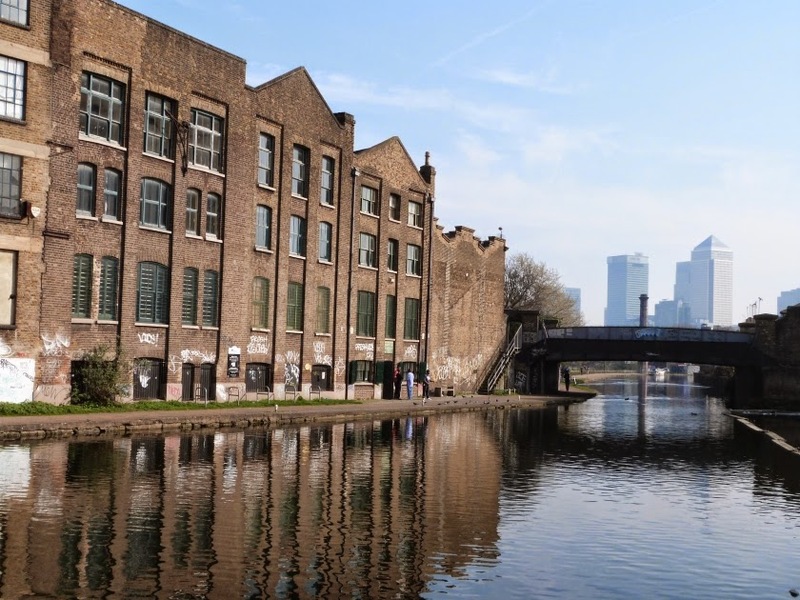 There are architectural gems, beautiful country views, historic places and quirky buildings in the area covered by the outer London Underground stations. Usually the discoveries are within a mile of the Tube - often only five minutes walk away. If you reached this as an individual page via a search engine, you might like to go to www.londontuberambles.co.uk to see the other destinations explored. You'll be amazed at what's out there!